In today's process-driven workplace, the most innovative and successful graduates can demonstrate a practical grasp of analysis, design and process modeling skills. With the Bizagi academy program, we can help you spend less time teaching and learning textbook concepts, and more time exploring how processes impact the real world. "To teach process automation, we needed a BPMS with little setup time and a gentle learning curve, so that students can focus on learning fundamental concepts rather than the specifics of a tool. Bizagi fits our requirements nicely. We set up and ran a process in under two hours. The tutorials are helpful and the tool offers step-by-step guidance. After a couple of weeks, students were able to implement non-trivial processes, enabling us to move into advanced concepts and cover a lot of material in less than half a semester." "Bizagi is my favourite BPMS. Why? First, it has a clear and understandable business object model (the E-R style representation and navigation of what's essentially an XML data structure). Second, a low resource impact/footprint. Third, a rationalized (spinning balls metaphor) progression to execution that makes common sense. Fourth, the inclusion of simulation. But most importantly, you are by far the quickest in helping us resolve problems." "I used Bizagi for the first time last year and had a very good experience. The platform has many benefits for the Business Process Management course that I teach. No programming is required, making it easy to use. It adheres to BPMN standards. And what I really like is the way it moves seamlessly between modeling and execution." 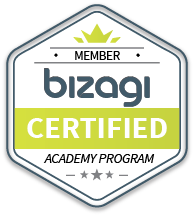 Why should you be a part of Bizagi academy? Click on the map to see universities that already joined! Sign up for an Academic License. Before you start, check our interactive map above to see whether you've signed up already. We accept one application per institution. Faculties, professors or research staff are all free to apply. Display your academy badge. Once approved, simply upload our badge onto your website. Your students are now free to download the software. We make it easy for you: students don't have to request anything from us, or from you: one application does it all. then we'd like to hear from you. to progress your BPM knowledge. eLearning Take our courses, watch our short videos and certify what you've learned. Modeler forum Ask questions and discuss BPM best practice with our modeling community. Studio forum Share ideas and resolve issues with our thriving automation community. Xchanges Why build from scratch? Reuse our model, app and user interface components. Help Solve your problems with our comprehensive online Help portal. Social media Follow our dedicated LinkedIn Group and interact with Bizagi practitioners.